Though many New Hampshire residents are desperate for an end to snow, some local Boy Scouts feel a little less antsy: they’ve been hiking year-round, in all kinds of weather. 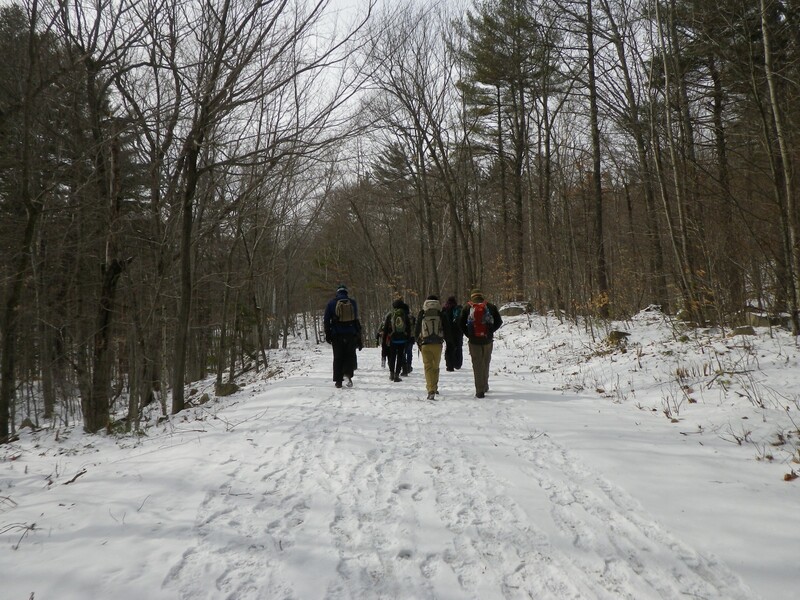 Nine scouts from Deerfield Troop 138 , in fact, went for an icy two-mile hike at Camp Bell in Gilmanton on Saturday, March 11, navigating slippery trails while carrying heavy packs laden with stoves, lunches, snacks, first aid kits and plenty of winter clothing. 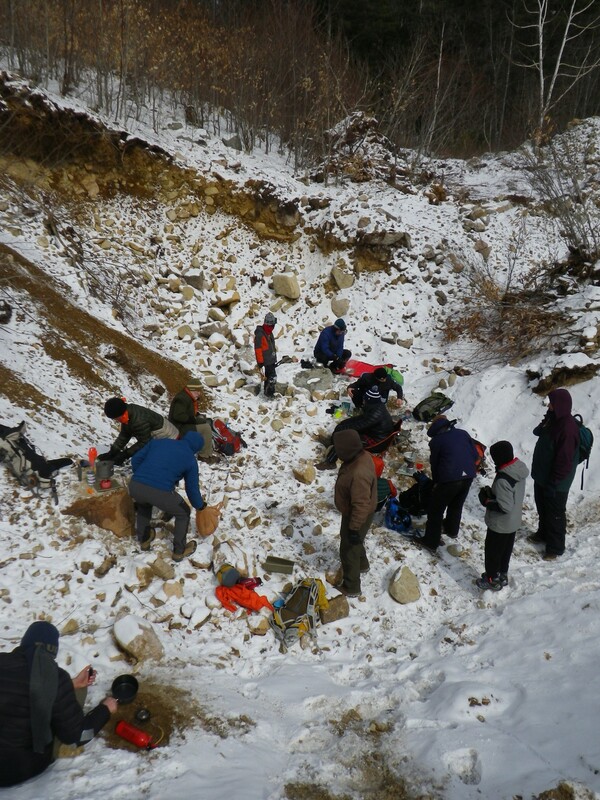 Wind chills lowered the temperature to 20 degrees below zero, but the Scouts persevered and completed the moderate hike in only two hours, including a half hour lunch break in an abandoned sand pit. There the Scouts used stoves to cook one hot meal, testing their knowledge of backcountry cooking in preparation for the troop’s upcoming backpacking trip to Philmont Scout Ranch in Cimarron, New Mexico, this coming August. “This is a really good way to practice setting up and taking down our stoves in brutal conditions,” said Scoutmaster Kevin Webber. Even out of the wind, temperatures were low enough to freeze meals inside the metal cook pots only a few short minutes after the meals had been cooked, making eating the entire meal in as little time as possible a major priority. Scouts followed Saturday’s hike with a trip to Gunstock Mountain Resort to go tubing. By the time the troop hit Gunstock, temperatures had dropped even lower, making hypothermia and frostbite real possibilities during the two hours of tubing. “You just have to cover up all of your skin, especially your nose and ears,” said Concord High sophomore Noah Buckner. Many scouts wore full face masks and ski goggles and multiple layers of gloves or mittens to help combat the sub-zero temperatures. The annual tubing trip is always looked forward to in Deerfield Troop 138, both for the fun of the tubing and the feeling of accomplishment after you spend the weekend in the bitter cold. Deerfield’s Boy Scout Troop 138, now in its 51st year, has approximately 14 scouts and goes on at least one trip each month. The troop is active year-round. 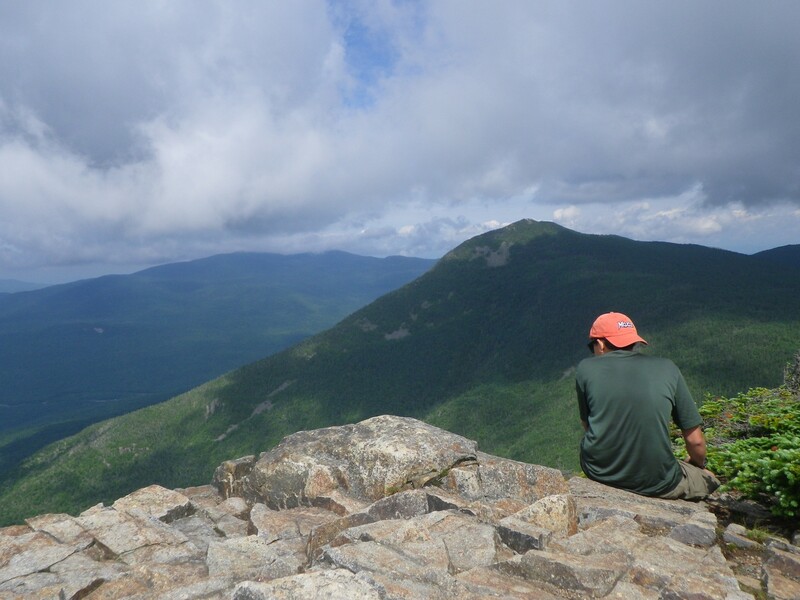 Last summer the scouts went on a week-long backpacking trip in the White Mountains. Scouts hiked from Mt. Liberty and then took a break at the summit of Mt. Flume to enjoy the view of Franconia Notch. Franconia Notch, located in the Eastern side of the White Mountains National Forest, is one of New Hampshire’s most popular tourist attractions and was home of the world-famous Man on the Mountain rock formation until it fell in 2003. Dozens of hiking trails border both sides of the Flume, the most popular arguably the trail to the summit of 5,249 foot Mt. Lafayette, and the well-worn trail to the AMC Lake of the Clouds shelter, respectively. Buckner, left, looks down into the southern end of Franconia Notch from Mount Flume. The White Mountains trip scouts took last summer, hiking more than 37 miles, is an option to all Boy Scouts over the age of 14 who attend a week of Hidden Valley Scout Camp in Gilmanton. 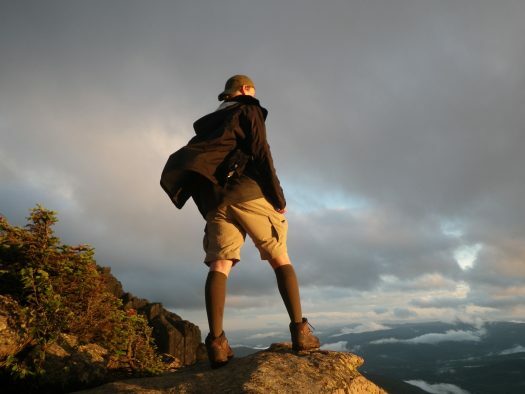 The trips utilize remote Appalachian Mountain Club campsites nestled among the dense forest. In this particular trip, the Scouts covered over 64,000 feet in elevation change, equivalent to more than twice the height of Mt. Everest. “I never want to go hiking ever again,” said CHS junior Clay Webber, exhausted at the conclusion of the trip. “The hardest part for me was carrying all of the food and equipment that I would need for an entire week,” said Buckner. Indeed, most of the packs that Scouts wore on this particular trip weighed upwards of 40 pounds, and had to be carried approximately 7 miles each day over challenging terrain. 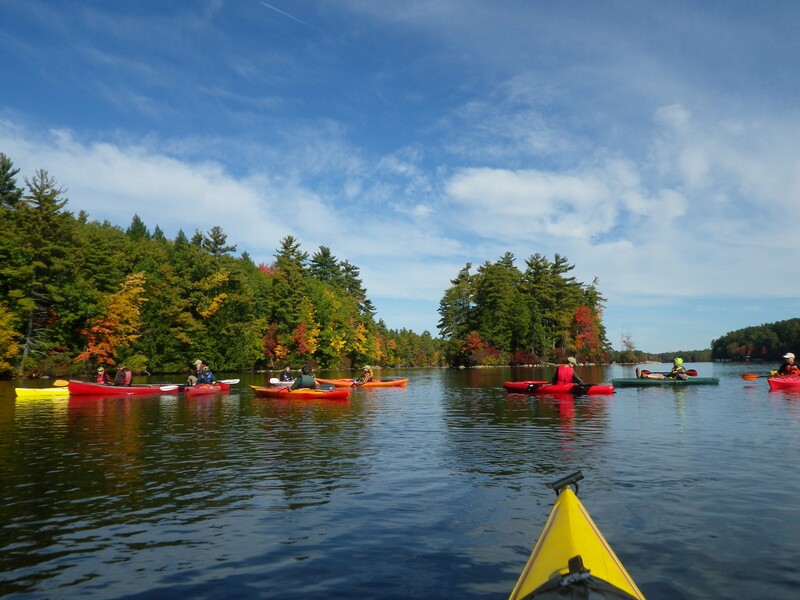 In addition to hiking, the troop frequently takes to water and last October headed to Pawtuckaway Lake in Nottingham for a day-long kayak trip. Each participant brought a kayak or a canoe, and the day was spent exploring the lake’s many shallow coves. The scouts ate lunch on an uninhabited island in the middle of the lake, and continued paddling almost until sunset. Scout Jacob Bair estimated that the troop paddled two and a half miles on that trip before watching the sunset back at camp over a dinner of Dutch oven-cooked pizzas. For its November trip Troop 138 camped at a remote site in Allenstown after a day of hiking and orienteering, which involves the use of a compass to find points plotted on a map. “It’s our Thanksgiving trip, which we do every year here,” said scout Ethan Tandy. 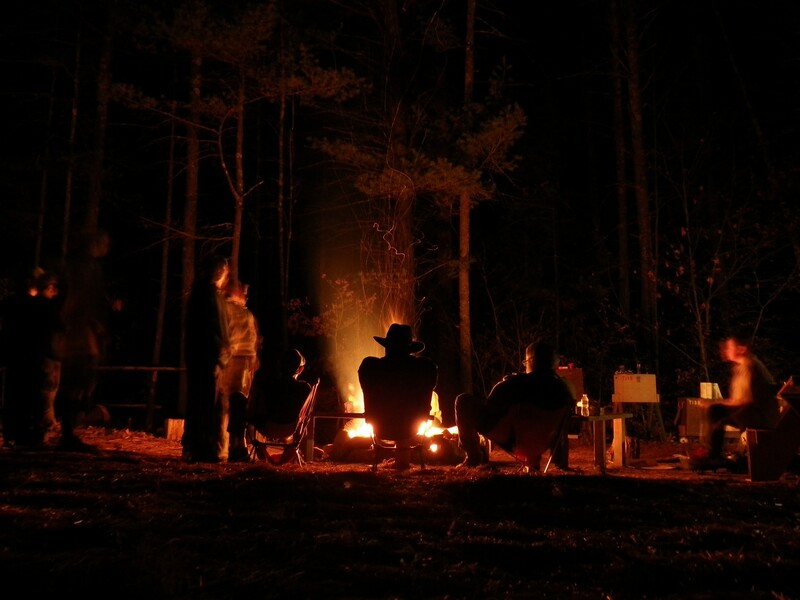 Part of the tradition is gathering around a campfire in the center of the camp to talk, joke and tell stories. Winter weather does not keep Troop 138 indoors. In early February scouts headed to Pleasant Lake in Deerfield to try ice fishing. Along with ice fishing equipment, they brought a gas grill, steel fire pit and plenty of wood, which ensured that the scouts and their leaders stayed warm and well fed throughout the entire day. 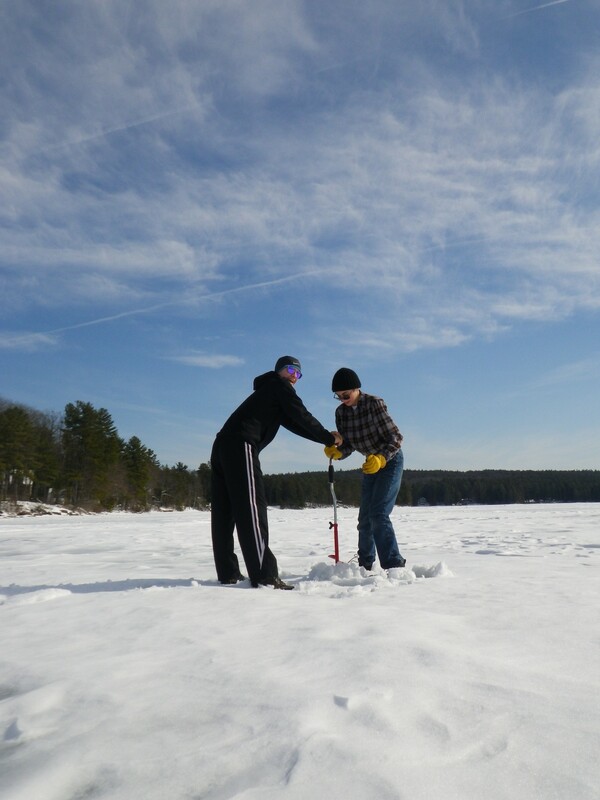 At left, scouts Anthony Fusco, a Concord High freshman, and Cooper Reese use an auger to drill a hole. Although ice fishing was the focus of the trip, scouts also had snowball fights on the lake and tried to get as close as possible to open water by the shore without falling in. Though they only caught two small fish all day, scouts agreed that the trip was a success. “It doesn’t matter that we didn’t catch much. What matters is that we had fun and enjoyed ourselves,” Fusco remarked.